At its April 2019 board meeting, the town of Santa Clara approved six amendments to its Land Use Code. Four of the amendments affect shorefront issues. 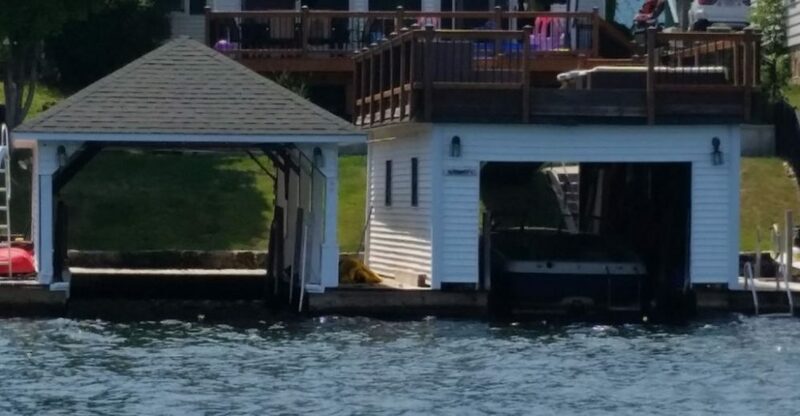 Amendments incorporated changes to the Land Use Code map, setbacks restrictions, docks, and boathouses. 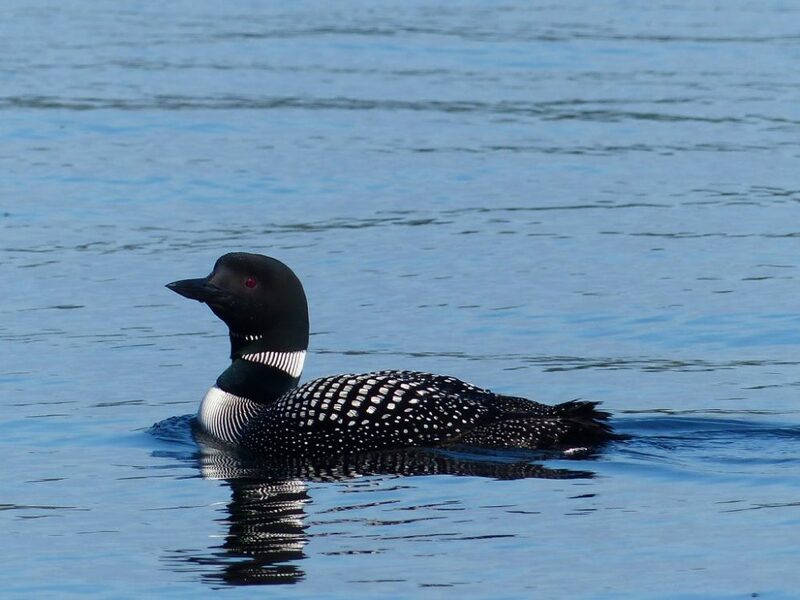 The Adirondack Center for Loon Conservation coordinates the annual loon survey that is conducted by volunteers throughout New York. The Annual Loon Census is held on the third Saturday of July each year. Data provides valuable population trends over time. 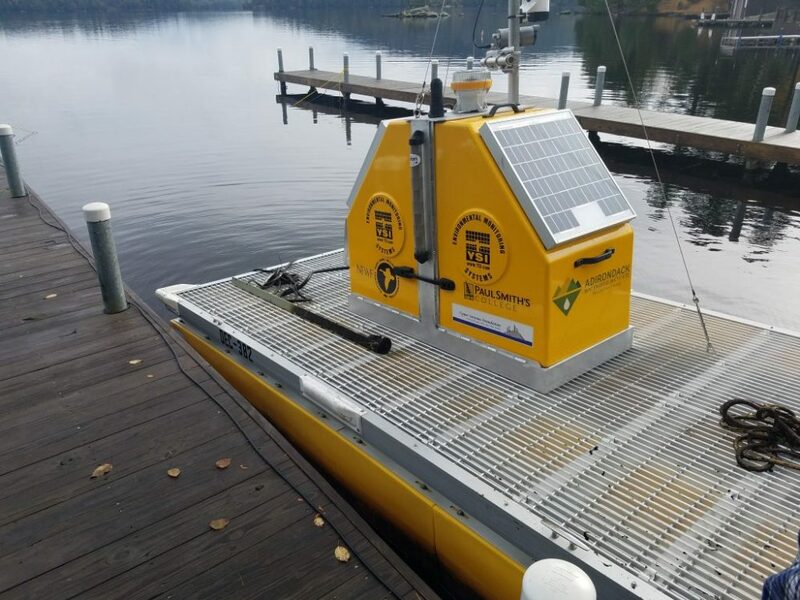 This report summarizes the success of the Upper Saranac Foundation’s Aquatic Invasive Species (AIS) management techniques and outlines work completed by Invasive Solutions Dive Company (ISDC). The Lake Champlain Basin Program announced a series of awards for projects that protect Lake Champlain regional waters. As in previous years, the USF was awarded a $15,000 Grant to help underwrite the cost of the Watershed Stewardship Program. The Watershed Stewards prevent the spread of Aquatic Invasive Species (AIS) by performing careful inspections of watercraft. Watershed Stewards funded from this award will be stationed on Upper Saranac Lake at Back Bay and at the Fish Creek Campground. The Upper Saranac Lake Watershed Stewardship Program is an integrated Aquatic Invasive Species (AIS) spread prevention program seeking to reduce or prevent the spread of AIS from entering and departing the USL watershed. 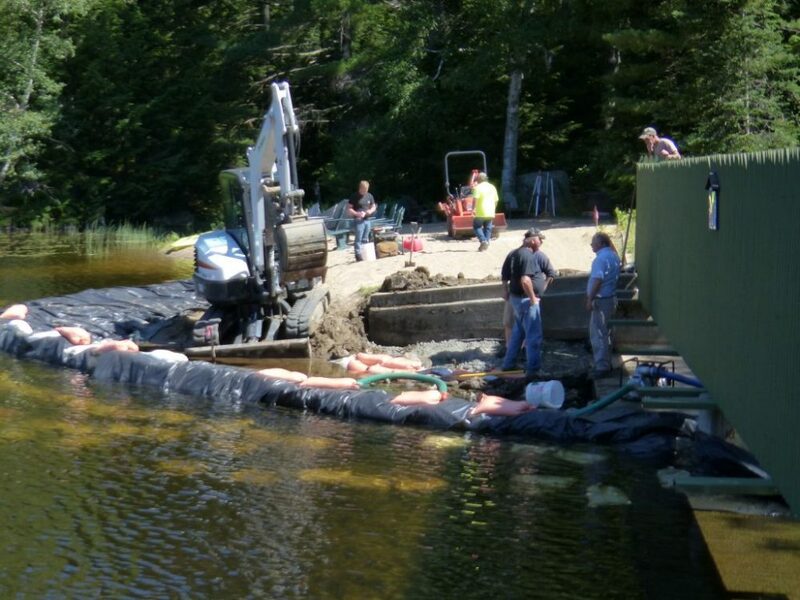 A study of Lake George septic systems that are within a critical distance of Lake George shows a startling number of residents are not upgrading or pumping their systems properly. An article in The Glens Falls Post Star stated that one-third of the systems are operating past their life expectancy, which is about 30 years. One-third of systems are operating within their life expectancy, and the remaining third are unknown. 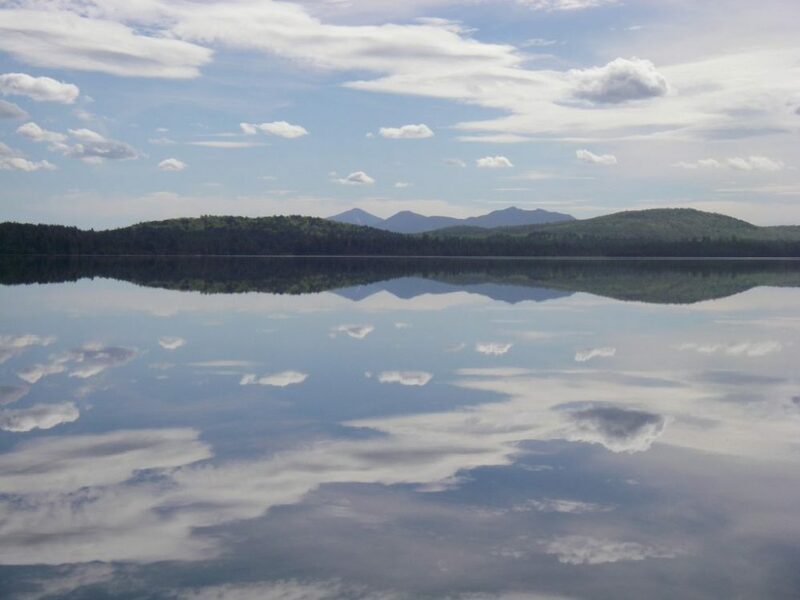 The state Adirondack Park Agency board determined that a plan for 75,000 acres of state land in the Tri-Lakes conforms with the Adirondack Park State Land Master Plan at its February monthly board meeting. The Saranac Lakes Wild Forest Unit Management Plan, originally released by the NYSDEC in 2017, was more than 15 years in the making. 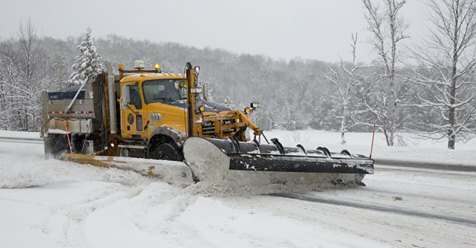 The Plan calls for sweeping changes to public lands around the Saranac Lakes, and includes proposals on everything from increasing public access to relocating camp sites and trails. 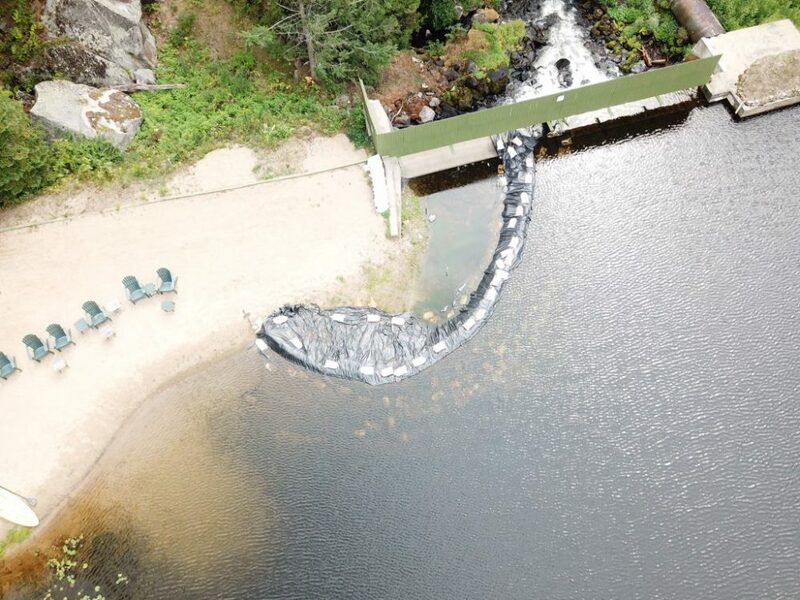 The 2018 Fish Creek Aquatic Invasive Species Management Report is now available on the Upper Saranac Foundations web page, http://usfoundation.net/wp-content/uploads/2019/01/The-Fish-Creek-Aquatic-Invasive-Species-Management-Project-2018-Report.pdf . This project depicts the Upper Saranac Foundations investment for the protection of our watershed now and for future generations. 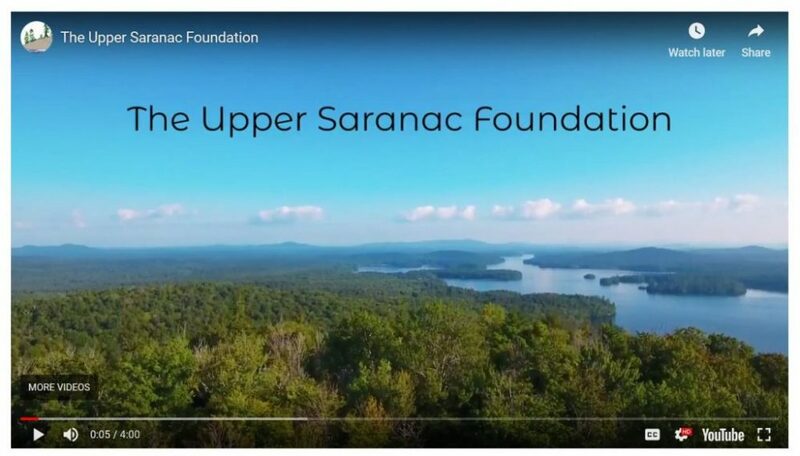 The Upper Saranac Foundation’s December’s Newsletter is now available. 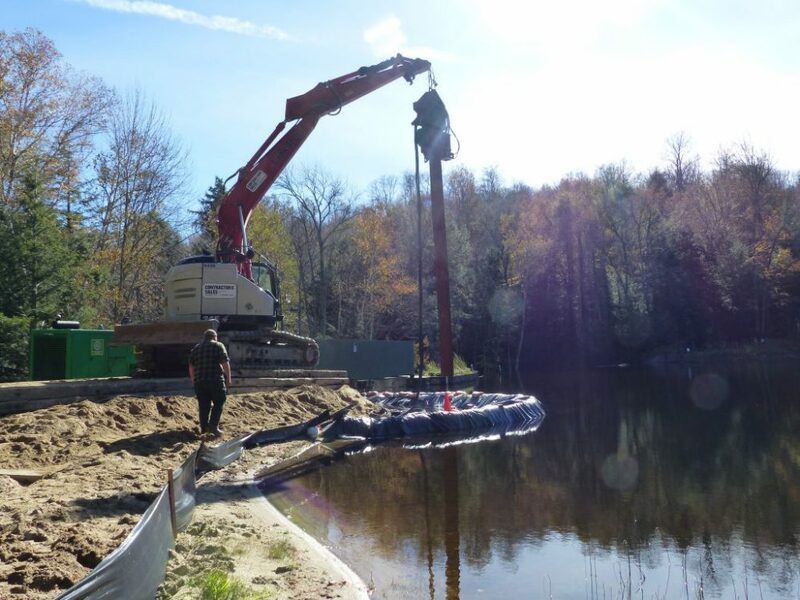 Read about the latest on repairs to the Dam, the Foundation’s new Board members, and a Report on the Milfoil project at Fish Creek Campgrounds. Upon completion of the onsite restoration of the north embankment, excavating equipment was moved to the south shore of the dam. Access was obtained through an easement on a road maintained by the Upper Saranac Foundation that crosses Private and State lands. Excavation of the embankment revealed the top of south cut-off wall. Several test pits around the wall were dug to determine the integrity of the wall and to determine if leakage was occurring. The test pits showed little water penetrating the wall and to be in better condition than the north cut-off wall. 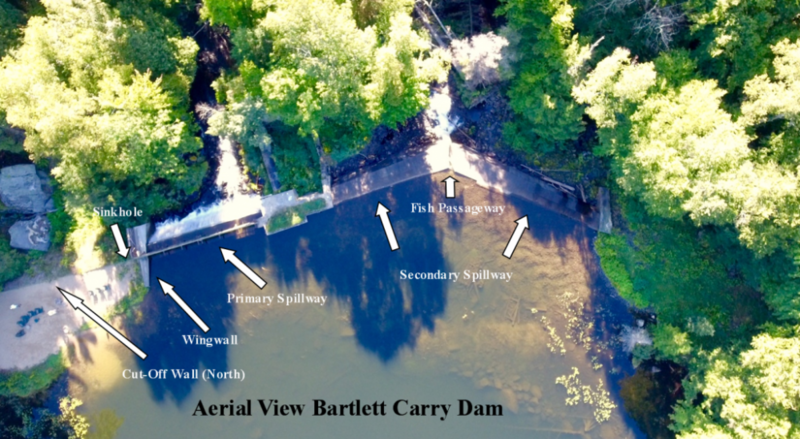 While there was some speculation that the sink hole and work on the Bartlett Dam impacted this year’s level, it was not the case. The water level is entirely dictated by the amount of precipitation and evaporation. The lack of early summer rain and sunny summer days kept the water low, and heavy fall rains brought it up. While the Dam does not have the capability to regulate the water level, the wide spillway does an excellent job maintaining consistency. This week further excavation of the north embankment cut-off wall exposed additional deterioration. Excavation, moving in a northerly direction on both sides of the wall, was completed one section at a time. This was done so not to expose too much of the wall at once, jeopardizing its integrity. It was apparent that some of the damage to the wall was caused by extensive root systems penetrating the concrete from the downslope side. Large trees on the downslope side of the embankment were removed in the fall of 2013 as part of the Upper Saranc Foundation’s maintenance plan for this very reason. 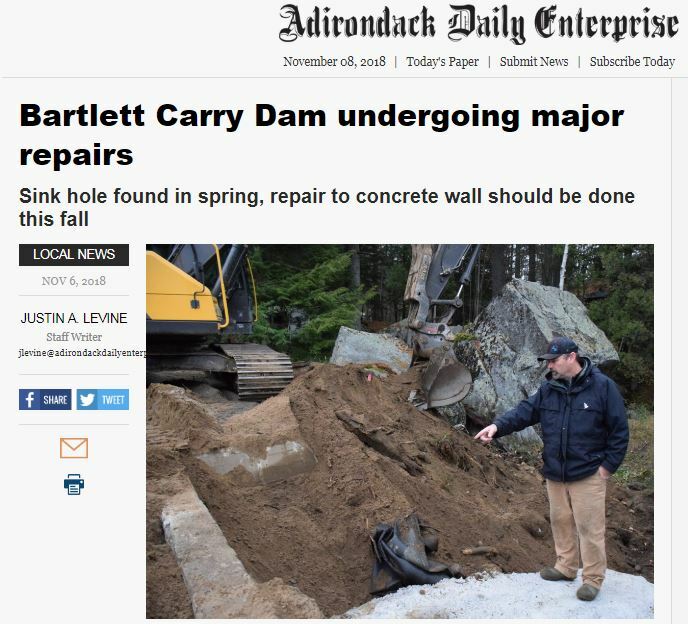 Repairs at the Bartlett Carry Dam were a feature story of the Adirondack Daily Enterprise this week. 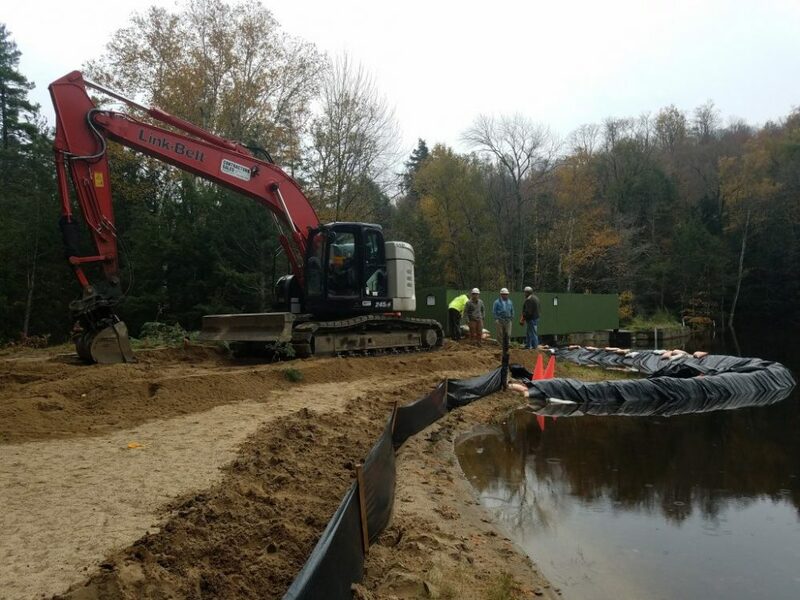 Reporter Justin Levine visited the work site and spoke with The Upper Saranac Foundation’s Lake Manager, Guy Middleton and Board Member, Jim Crane. This week, installation of the temporary interlocking sheet piling wall was completed. The sheet pilings assured stabilization of the soil behind the temporary coffer dam and in front of the north cut-off wall and wing wall. This allowed excavation up to 12 feet deep exposing the area next to the spillway, both in front of the north cut-off wall as well as downstream. Are Unwanted Migratory Birds Taking Up Residence? 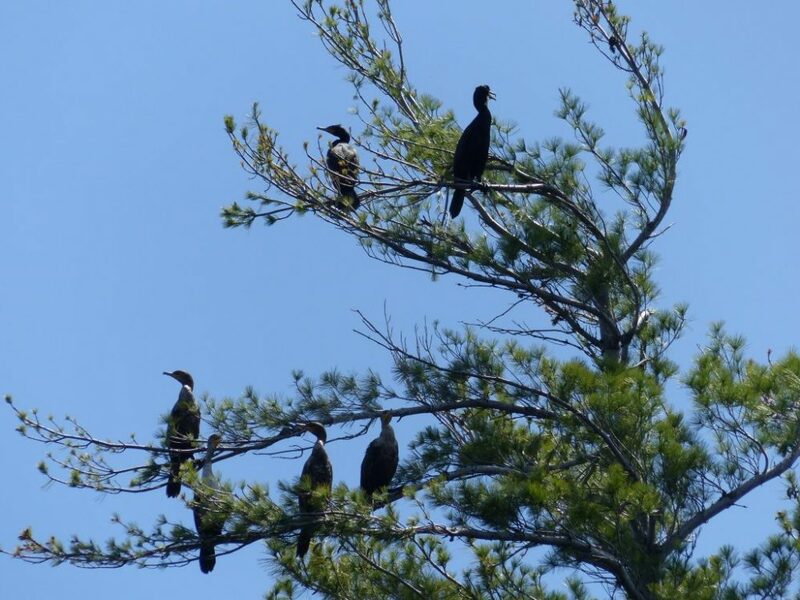 Cormorants are a familiar bird to the Great Lakes and Lake Champlain, but have you seen these birds on Upper Saranac Lake? Known to be a coastal bird, Cormorants were first noticed in Lake Champlain in the early 70’s. More recently they have been showing up on interior lakes of the Adirondacks. Yesterday the Environmental Monitoring Platform was put on a trailer and will be put into storage for the winter. 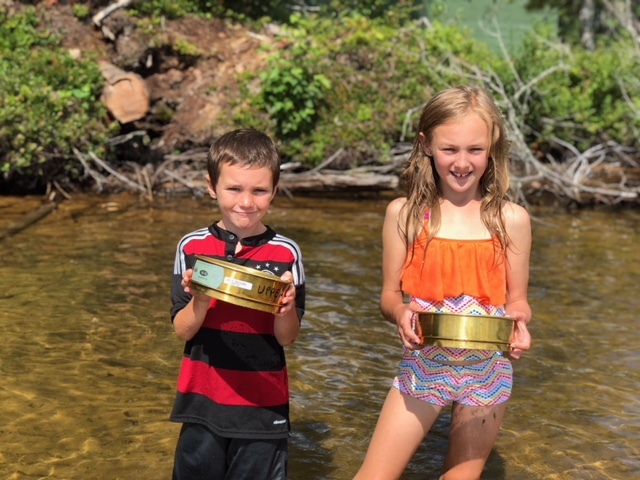 Data collected over the summer will be analyzed by the Adirondack Watershed Institute (AWI) and added to the data we have been collecting since 1989. All permits and approvals for construction of Phase Two of the Bartlett Carry Dam have been granted and obtained. Upon receiving the required approval, work began almost immediately. The contractor has mobilized equipment to the site and in the first day of work constructed a temporary access road to the dam. The contract in the amount of $215,000 for Phase Two of repairs to the Bartlett Carry Dam has been awarded to J.E Sheenan Contracting Co. from Potsdam, NY. The work will begin as early as next week, and is expected to conclude by mid-December. Phase Two of the project includes building a temporary access road to the dam, clearing the embankment, upgrading the existing coffer dam, including dewatering and stabilizing the area behind the existing coffer dam. The concrete cut-off wall and north wing-wall will be excavated and replaced. 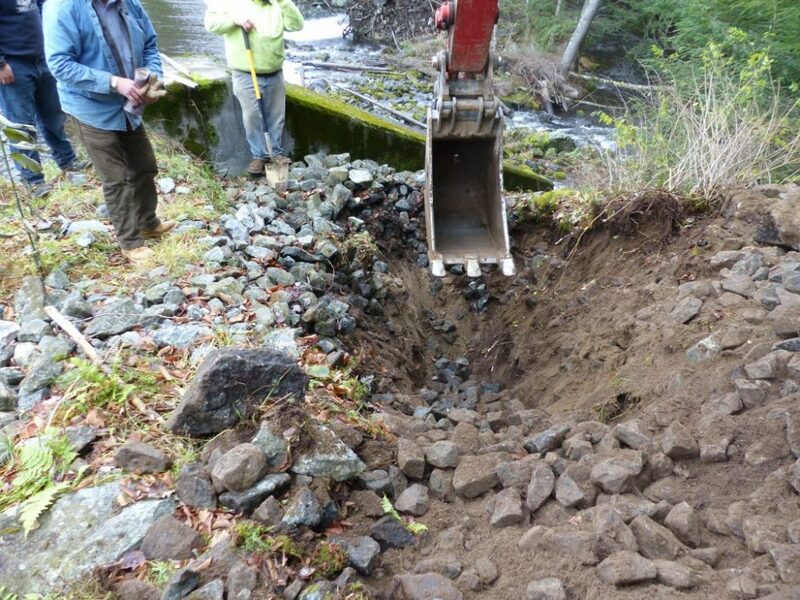 In addition, the downstream side of the cut-off wall will be excavated and fill removed and replaced with stone. The work site will be fully restored, including removal of the temporary coffer dam and access road. Request for Proposals (RFPs) were distributed to seven contractors for consideration this past week. Four contractors visited the dam and reviewed the required work with the Lake Manager and our Engineer. It is anticipated that there will be three bids submitted. These bids were due on Thursday, October 11. The RFP specified that the work be completed by December 15, 2018. The Fish Creek Campground Aquatic Invasive Species Management Project (FCAISMP) has wrapped up for the season. 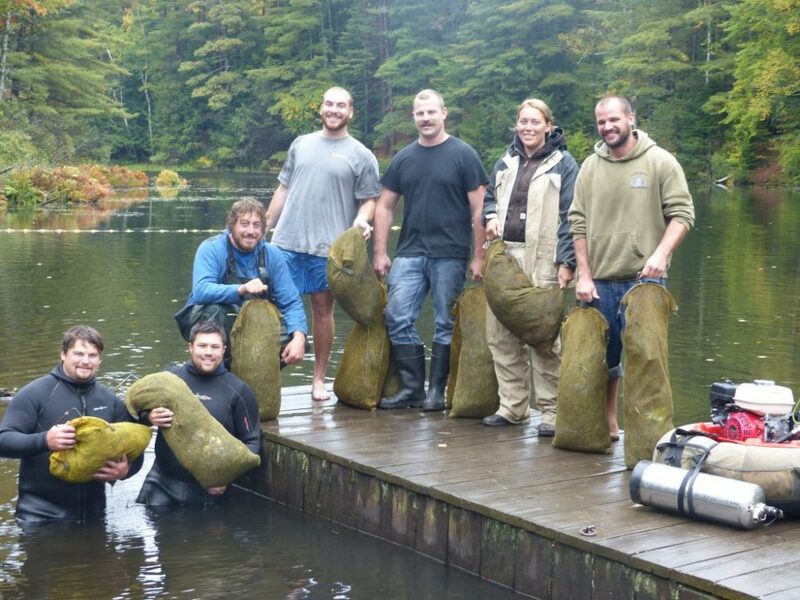 This year divers removed 3 ¾ tons of the invasive milfoil plant from within the campground’s waters. From the beginning of the harvesting program, three years ago, over 20 tons of the nuisance plant has been removed. To date a total of 1,400 diver hours have been put into this effort and all 108 littoral acres of the campground, Fish Creek and Square Ponds have been harvested. 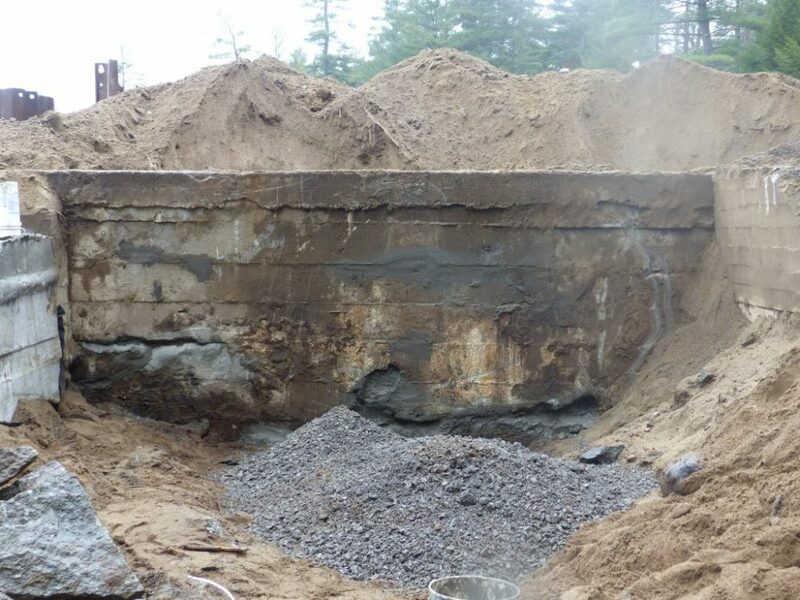 The Upper Saranac Foundation has contracted Blue Mountain Engineering to oversee the repairs of the dam. This work includes reviewing and making an assessment of the development of the sinkhole in May, followed with an investigative report. In addition, Blue Mountain Engineering will analyze what repairs are needed and develop an engineering design plan. They will also oversee all required permitting, obtain bids and oversee the construction phase of the project. It’s not only Milfoil that our divers find on the bottom of the lake. 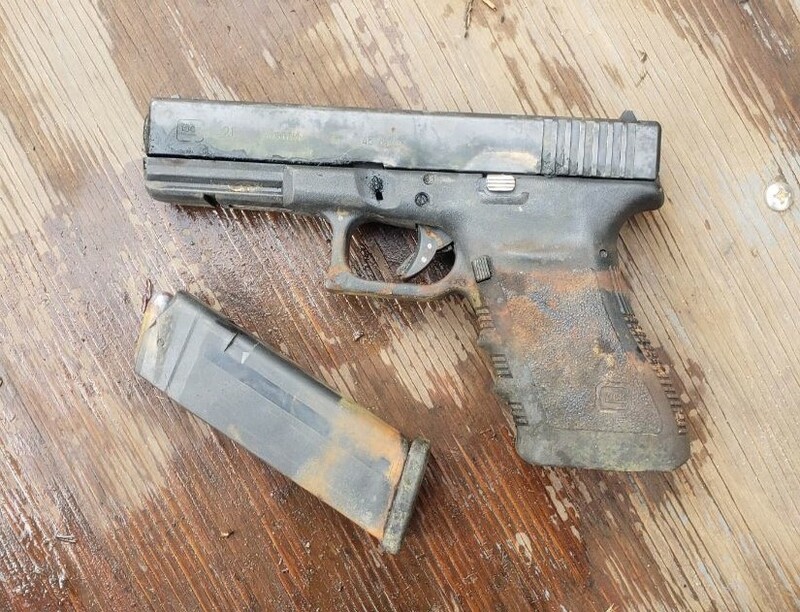 Recently they found a handgun located in the muddy sediment of Fish Creek Pond Campgrounds. While finding items like fishing poles, bottles and anchors are a fairly common occurrence, this is the first time a handgun has been found. Thoughts of uncovering a key piece of evidence in an unsolved mystery quickly came to mind. Fundraising is going well. The response from the Lake Community has been fantastic. We are still short of our goal of $300,000. We are in the process of submitting engineering plans to the DEC for approval and the Army Corp of Engineers. We are also working with the Towns of Harrietstown and Santa Clara for their support and input. 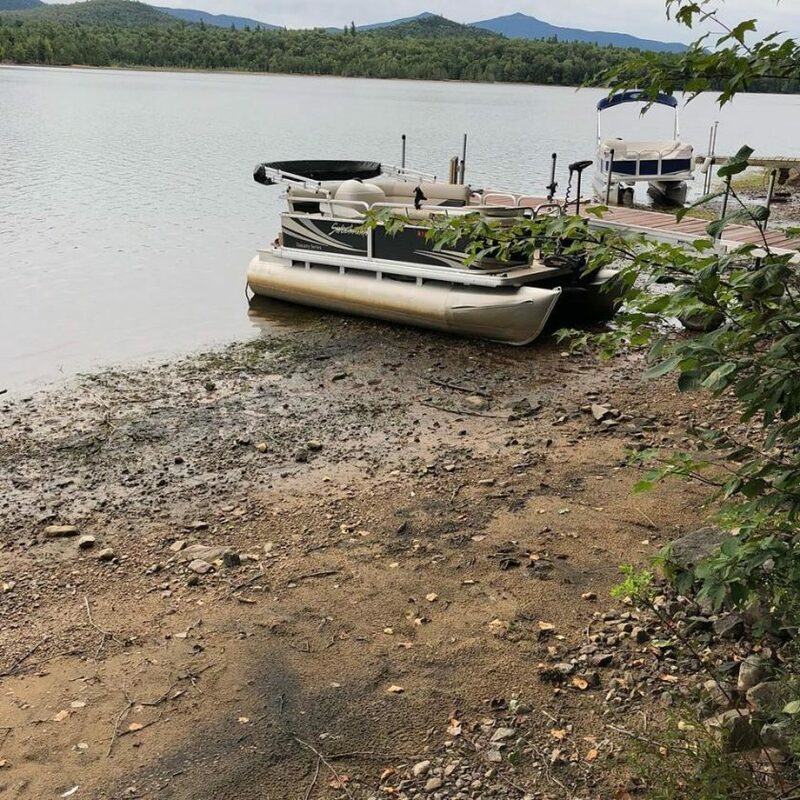 A recent Adirondack Daily Enterprise article reported that boat owners on Union Falls Pond found their boats high and dry earlier this week. The owner of the Union Falls Dam, Kruger Inc., lowered the lake to work on needed repairs. Similar to the Bartlett Carry dam, the Union Falls dam was built in the early 1900s and both dams are overseen by the regulatory authority of the NYSDEC Dam Safety Division. As owners of these dams, it is our responsibility to perform mandated required repairs to maintain the long term character of the lake and assure the safety of those below. The Bartlett Carry Dam is just one of many dams in the Adirondacks that were built in the early 1900s. Many of these dams are seeing significant deterioration. 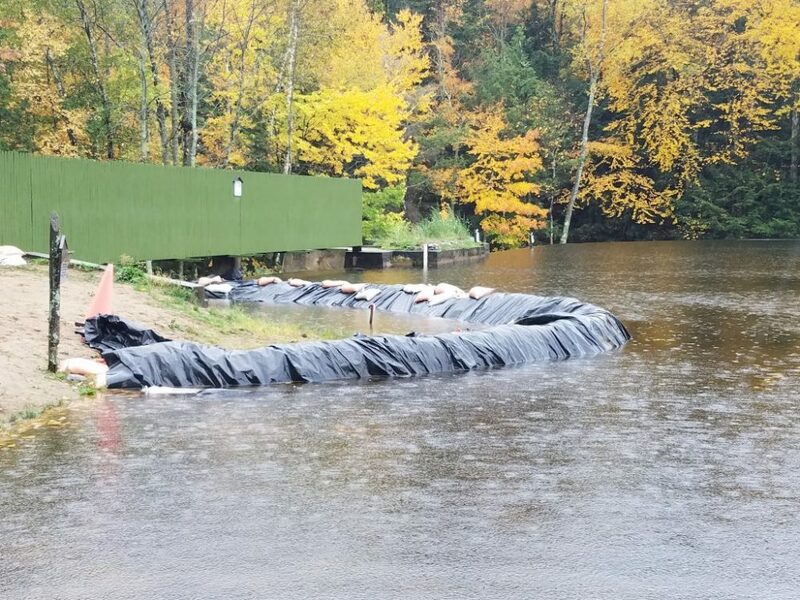 As noted by the Ausable river Association, recently the Rome Dam, which has not been maintained since 1971, was the most recent dam to be removed and the water impoundment above, dewatered. The Rome Dam was located on the Ausable River just upstream from the hamlet of Ausable Forks. The State of New York, through the dam safety arm of its Department of Environmental Conservation, deemed the Rome Dam a “high hazard”, meaning that its failure could result in the loss of life. The dam was also rated as structurally unsound and the risk of dam failure was high. These determinations required the Town of Jay, who owns the dam, to take action. 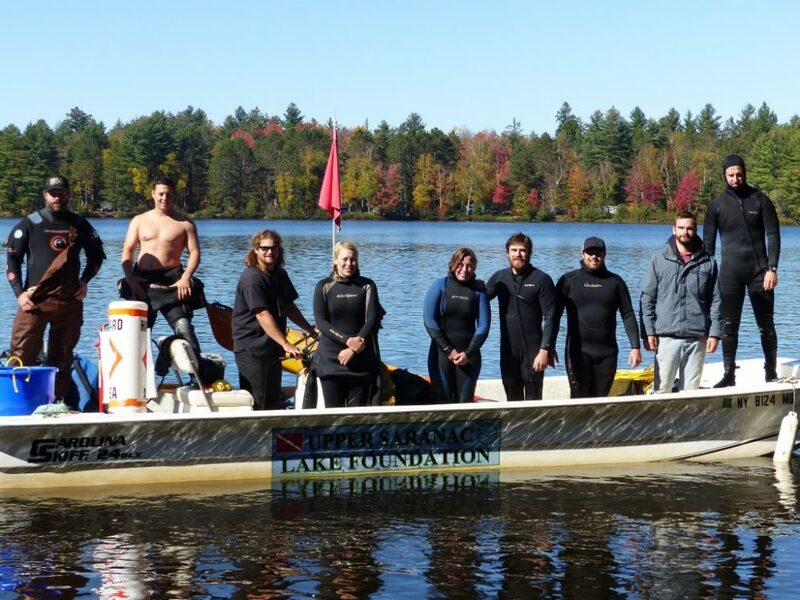 The Upper Saranac Foundation’s Fish Creek Aquatic Invasive Species (AIS) Management Project is its third year of the program. 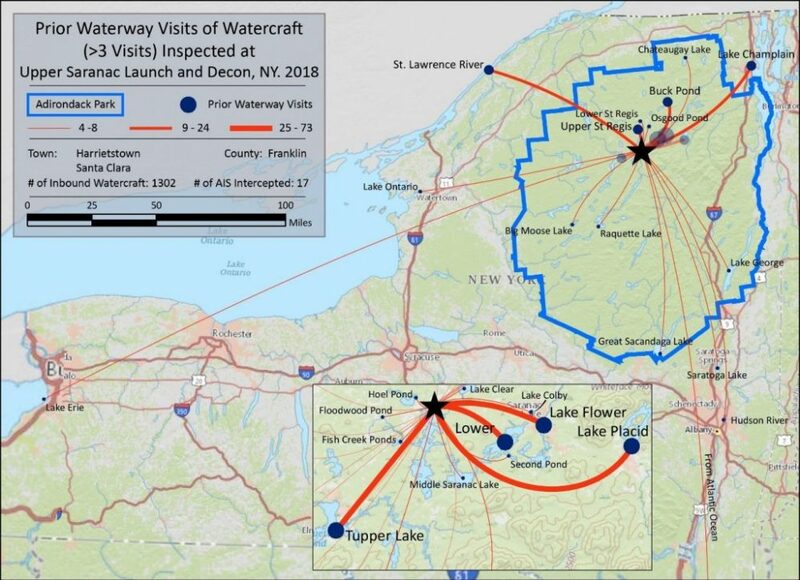 This intent is to reduce the spread of AIS and improve the water quality by removing Eurasian watermilfoil and Variable-leaf milfoil, two AIS found in the waterbodies of the NYSDEC Fish Creek Campground. 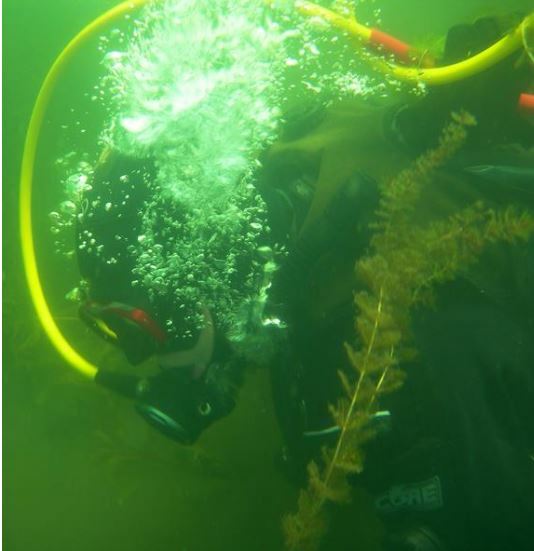 Divers remove the aquatic plants by manually hand harvesting each plant and root system. In the first two years of the project, 17 tons of AIS was removed. Divers this year will be working into the beginning of October. 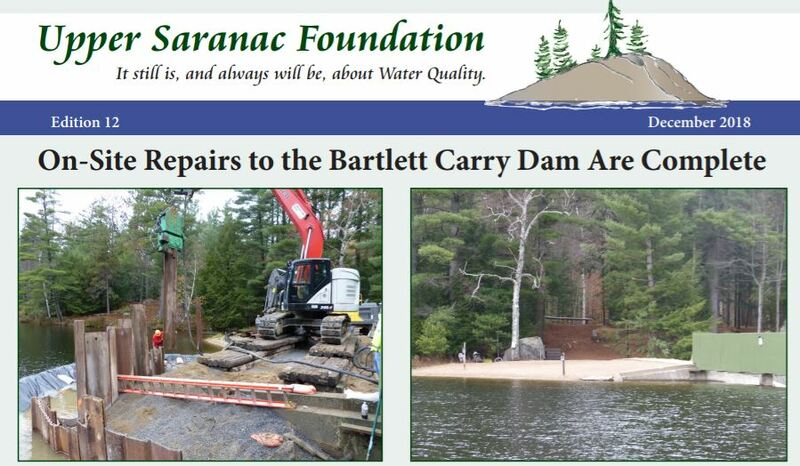 Phase 1 repairs to the Bartlett Carry Dam were just completed at a cost of just under $40,000. The work included construction of a coffer dam around the wing wall of the north spillway. This was done to determine the extent of the repairs needed. If all goes to plan, Phase 2 will begin in early September. There is no question if the work will be done, but when. We will begin upon approval from all permitting agencies. The cost of Phase 2 is projected to be well in excess of $200,000. On May 5th, a sinkhole was discovered on the north side of the Dam. 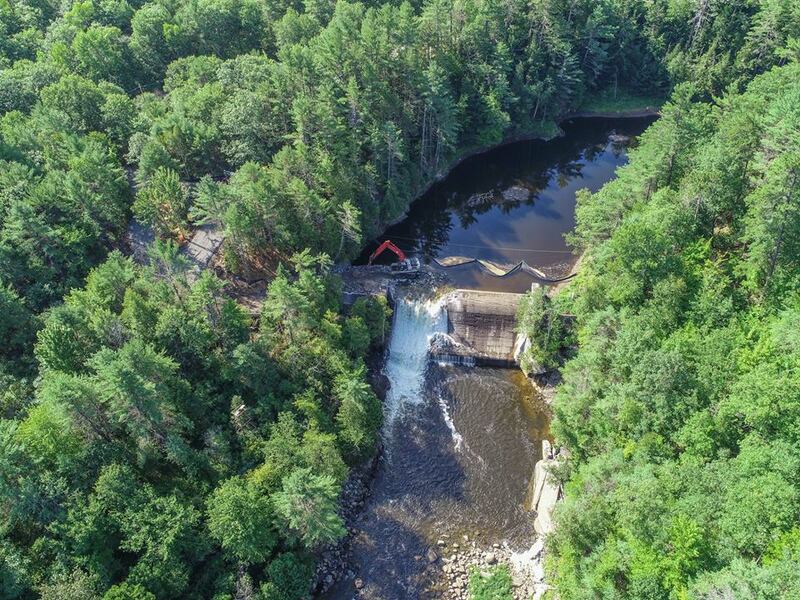 As owners of the Dam, the Upper Saranac Foundation, working with Blue Mountain Engineering, has taken the lead in putting forth a game plan to repair the dam this fall. 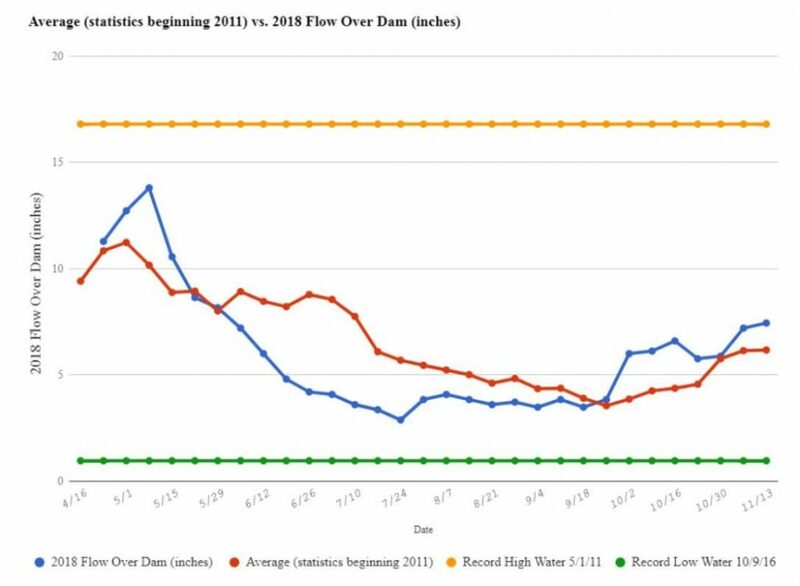 Invasive Solutions Dive Company, who is contracted to harvest invasive milfoil by the Upper Saranac Foundatiom has logged 1,080 hours of dive time in nine weeks so far this summer. In this time period the divers have removed 106 lbs. of Eurasian Water Milfoil and 102lbs. 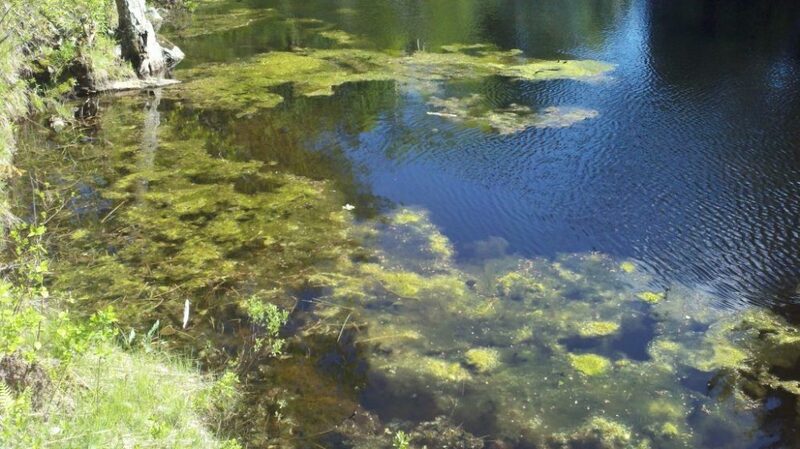 of Variable-Leaf Milfoil from Upper Saranc Lake and Lower Fish Creek Pond. 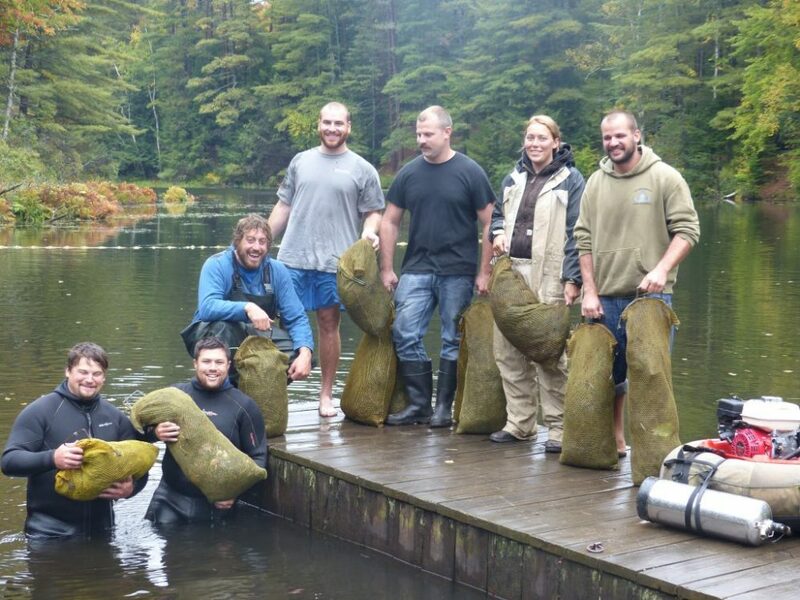 In comparison, in 2014, the first year of the harvesting program, divers removed 18 tons of the invasive plants. Harvesting totals have remained consistent for USL averaging approximately 300lbs/ year for the last three years. 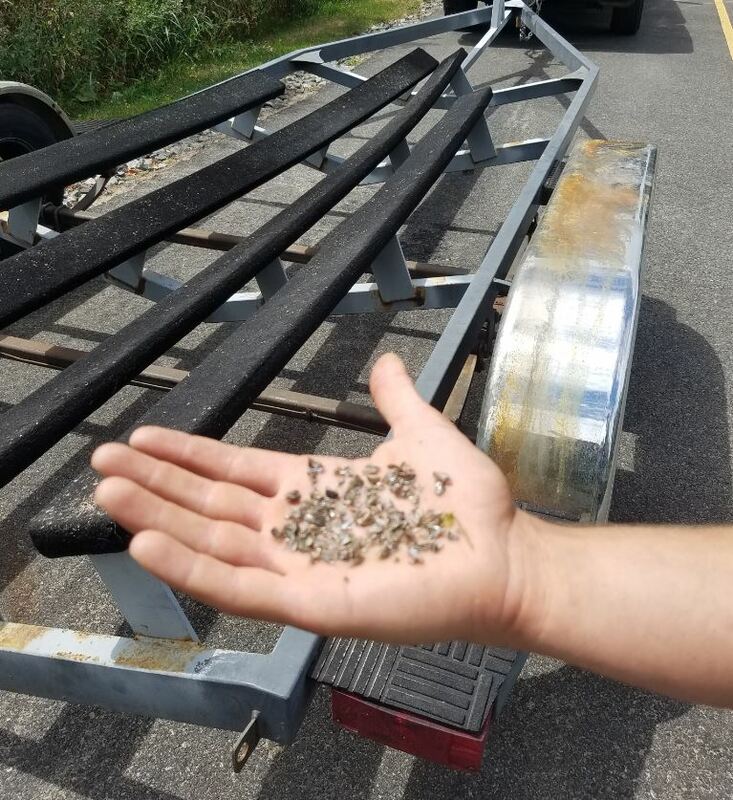 Upper Saranac Lake Watershed Stewards intercepted a boat entering Back Bay that was covered in Zebra Mussels. 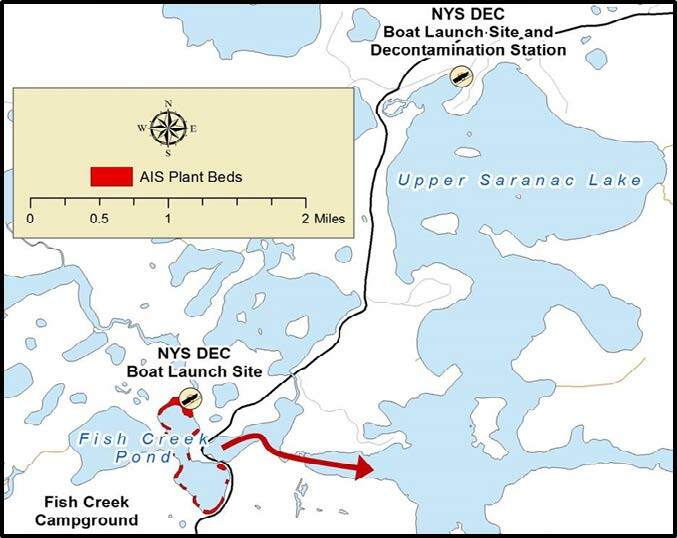 The boat, originating from the Hudson River was decontaminated using the Upper Saranac Foundation’s high pressure, hot water decocontamination unit. The Upper Saranc Foundation’s volunteer Asian Clam Survey is underway. Thank you to all the volunteers who are participating. Although we hope that Asian Clams are not in existence in the Lake, this annual survey effort will determine if they have been introduced into the watershed. Early detection of the Clam is imperative for eradication. 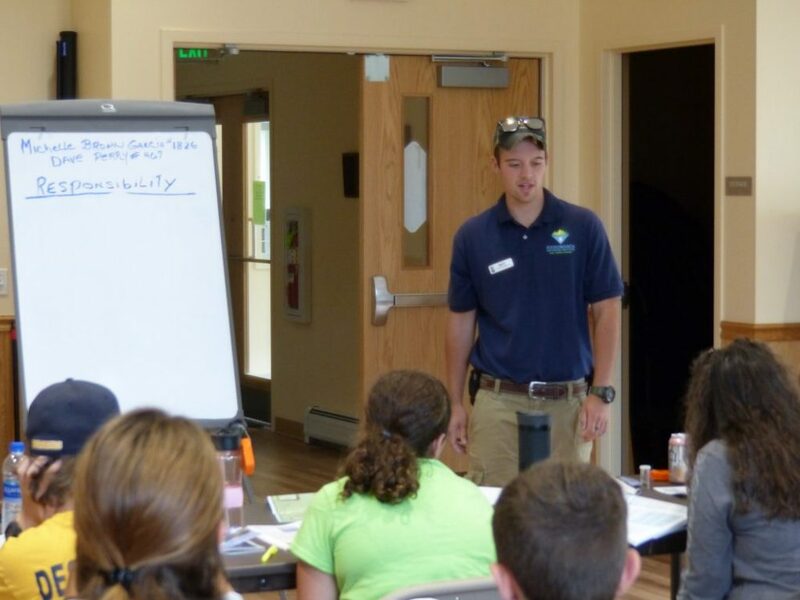 Matt Simpson from the Adirondack Watershed Institute made a presentation at the Upper Saranac Lake Associations Boater Safety Course earlier this week. 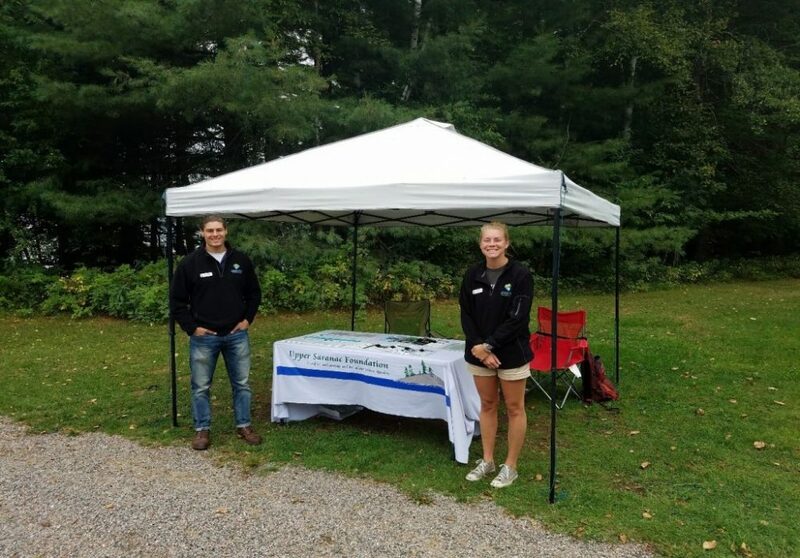 Matt discussed the importance of preventing the spread of invasive species and highlighted the work being done by the Upper Saranac Foundation and AWI in this cause.